we can design a Custom Cabin just for you. The Consumer Rights Act 2015 came into force on 1 October 2015. It governs purchases made on and after that date. The Delivery Policy is intended to ensure that all parties (Us, the Carrier and You) understand what is required at each stage of the process. The Delivery Policy is part of the Terms and Conditions ('T&C'). All Definitions and Interpretations in the T&C apply to the Delivery Policy. 1.1. We will advise You of an estimated delivery date after We have confirmed Your Order. This date is an estimate and will be confirmed by the Carrier or by Us. 1.2. We normally estimate that You will receive Your Goods within 35 working days of Our receipt of Your Order. You must ensure that any balance of payment due for Your Order has been credited to Our bank account before the delivery date. We will postpone delivery of Your Goods until the payment has been credited to Our account. 1.3. We will liaise with the Carrier to re-arrange delivery of Your Goods after receipt of Your payment. 1.4. Please refer to the T&C for details of how the Carrier or Us will contact You to arrange the delivery of Your Goods. 4.1. The Carrier can deliver to postcodes that are not included in the above list. All of these deliveries are subject to an additional charge which will be estimated by the Carrier. Please call Us on 01403 888 222 for further information. 8.2. 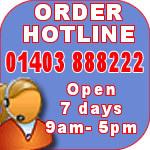 The Carrier will advise You of any delay to Your delivery by telephone as soon as possible. Please ensure that You have given Us current and complete contact details. You must let Us know prior to the delivery if any details have changed as we cannot accept responsibility for any consequent issues or costs. 9.1. When You place Your Order You must advise Us of any access issues that could prevent the delivery of Your Goods, otherwise extra charges may subsequently required. It may not be possible to make the delivery at all, and You will be charged for return and storage of the Goods. 10.2. We cannot guarantee that the Goods will remain in perfect condition if they are stored for an extended period of time because any moisture that is within the wrapping cannot escape and would cause ‘sweating’. 10.3. 'Sweating' will damage the Goods. 11.1. Each delivery is allotted 30 minutes. The Carrier will make an additional charge if the delivery exceeds 30 minutes. All deliveries are made to the kerbside and are made by one delivery driver. 11.2. Subject to prior agreement with the Carrier, which is arranged by calling Us on 01403 888 222, the Carrier can enter Your property. The Carrier can refuse to enter Your property if the Carrier decides that the conditions are unsuitable. 11.3. The Carrier is not liable for any damage incurred and You permit the Carrier to enter and/or offload into Your property at Your own risk. Vulerable areas could include (but are not limited to) manholes, drainage grills & grates, soft or waterlogged ground, grassed areas, trees & tree branches, flower beds which could be damaged (by the delivery lorry or by the Goods when setting them down on the ground) unless You cordon them off with high visibility tape or protect them with boards or road-plates. It is Your responsibility to warn the driver od vulnerable areas and they are not always obvious. 11.4. The Carrier will not transport the Goods to the site where the Goods will be erected so at least 2 able-bodied people must be present at the delivery to assist with offloading the Goods. estiThe Carrier will refuse to deliver if 2 able-bodied people are not present and will returns the Goods. You will be charged for return and storage of the Goods. 11.5. We can provide an estimated delivery time but this is not guaranteed. We advise against employing contractors to install Your building on the day of delivery and can accept no responsibility for any consequent issues or costs. 11.6. Some delivery vehicles may be fitted with video recording equipment for accident and security purposes. Please refer to the T&C. For legal reasons, a person who is at least 18 years old must sign for receipt of the Goods. The Carrier cannot accept a signature from a person who is or appears to be under the age of 18. If the Goods are delivered to public premises then the Carrier will consider that the person who signs for receipt of the Goods has been authorised to do so on Your behalf. This signature will be considered to be proof of delivery.